This interesting name is of Anglo-Saxon origin, and is a locational name from Winstanley, near Manchester, in Lancashire. The placename is composed of the Olde English pre 7th Century personal name "Wynstan", composed of the elements "wynn", joy and "stan", stone plus the Olde English word "leah", which originally meant a forest, but later "a clearing in a forest". Thus the placename could translate as Wynstan's forest, clearing or enclosure in a forest. 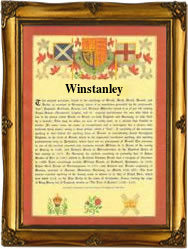 It was recorded as "Unstanesle" in the Lancashire Pipe Rolls (1206) and as "Winstanesle" in the Feet of Fines (1212). The surname itself first appears in the late 12th Century. One Hugh de Wynstanlegh was recorded in Lancashire in 1387 in the Lancashire Inquisitions. The Wills at Chester in 1555 mention a James Winstanley, of Winstanley. A notable namebearer was Gerrard Winstanley, who came to notice in 1649, when leading a band of men who cultivated waste land in Surrey to assert the right of common people to do so without paying rent. Henry Winstanley (1644 - 1703) was the engineer who designed the Eddystone lighthouse in 1696, and lost his life in a storm which also destroyed it. Five Coats of Arms have been granted to Winstanley families including that of Sir Thomas Winstanley of Lancashire (circa 1216), one of the knights attendant on the Black Prince in the expedition into Spain, which depicts two silver bars in chief and three red crosses formee, on a gold shield. The first recorded spelling of the family name is shown to be that of Roger de Winstanley, which was dated 1199, in the "Pipe Rolls of Lancashire", during the reign of King Richard 1st, known as "Richard the Lionheart", 1189 - 1199. Surnames became necessary when governments introduced personal taxation. In England this was known as Poll Tax. Throughout the centuries, surnames in every country have continued to "develop" often leading to astonishing variants of the original spelling.